Last major update issued on December 18, 2004 at 05:30 UTC. The geomagnetic field was quiet to active on December 17. Solar wind speed ranged between 538 and 661 km/sec under the influence of a high speed stream from coronal hole CH133. Solar flux measured at 20h UTC on 2.8 GHz was 89.9. The planetary A index was 15 (STAR Ap - based on the mean of three hour interval ap indices: 15.0). Three hour interval K indices: 34332323 (planetary), 35432322 (Boulder). Region 10710 was quiet and stable. New region 10712 emerged in the southeast quadrant. New region 10713 rotated into view at the southeast limb. [S489] This region emerged early in the day just to the east of region 10710. Unfortunately SEC/USAF did not manage to separate this emerging bipolar region from the stable bipolar region 10710. December 15-17: No obviously Earth directed CMEs observed. A full halo CME was observed in LASCO C3 images after 19h UTC on December 15. Its source was likely a few days behind the northwest limb. An extension (CH133) of the northern polar coronal hole was in a geoeffective position on December 13-14. A recurrent coronal hole (CH134) in the southern hemisphere will likely rotate into a geoeffective position on December 18. 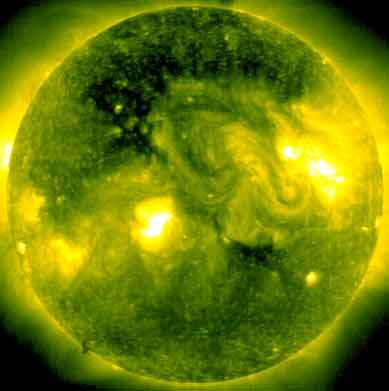 The geomagnetic field is expected to be quiet to active on December 18 under the influence of a coronal hole flow and quiet on December 19-20. 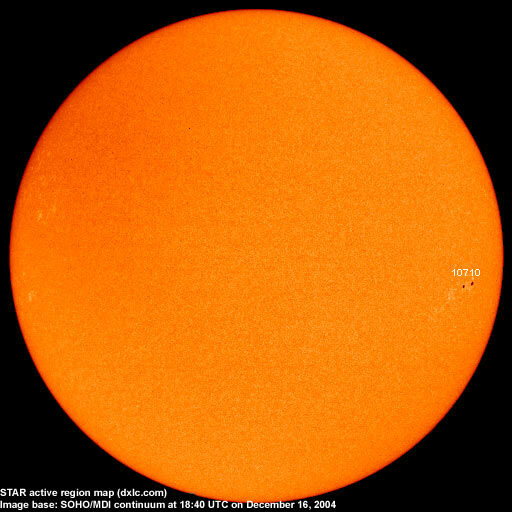 Another and weaker coronal hole flow could arrive on December 21 or 22 and cause some unsettled and active intervals. Long distance low and medium frequency (below 2 MHz) propagation along east-west paths over high and upper middle latitudes is poor (approaching poor to fair). Propagation along long distance north-south paths is poor. Trans Atlantic propagation conditions are normally monitored every night on 1470 kHz. Dominant stations tonight: Radio Vibración (Venezuela) and WLAM Lewiston ME. Several stations from the easternmost parts of North America could be heard on other frequencies with the best signals above 1400 kHz.